The fiftieth reunion of Company A 131st Ohio Volunteer Infantry at the Phillips House in May 1914. 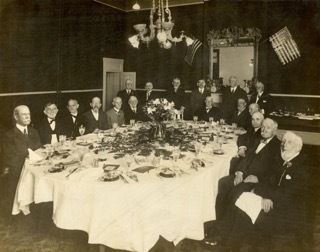 Members sitting around the table left to right are: John H. Patterson, Thomas J. Dicks, W. H. Knecht, Henry Hershelrode, Winslow Phelps, Eugene Wuichet, W. L. Bates, W. W. McCream, Howard Best, F. P. Beaver, Henry C. Gump, and M. L. Dady. Standing left to right are: George W. Keifer, Edward E. Buvinger, Charles Wuichet, J. J. Langdon, E. S. Forgy, and Morris Woodhull.